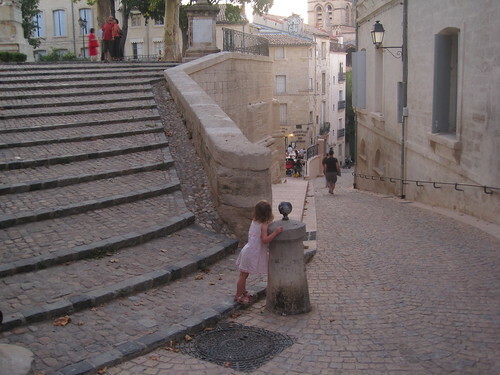 This little place is a gem, and its immediate environs the most pleasant spot we've found in Montpellier. According to the Routard, it was cleared to make way for a new church in the early 17th century. When that project was abandoned, the grounds became public. Update (2009-08-01): I don't know my way around OSM very well, and just now stumbled onto another representation of Place de la Canourgue at http://api.openstreetmap.org/browse/way/8105279. This one has links to its nodes and connected ways. Are these "browse" URLs as cool as they look like they could be? This street has been remade during this year, and it's very nice.